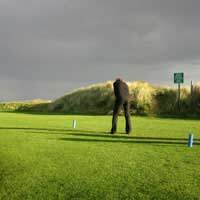 According to the English Golf Union the governing body for the amateur sport in this corner of the United Kingdom, over 1,900 clubs come under its umbrella. Add to that the facilities to be found in Scotland, Wales and Northern Ireland, and not forgetting the Isle of Man and the Channel Islands, and it is clear to see that there is a generous amount of choice to be had.Ireland, too, is a major centre of the sport, attracting players from around the world for major professional tournaments as well as enthusiastic amateurs keen to sample both the superb courses and a burgeoning hospitality industry that has benefited from the effects of the Celtic Tiger economy. Royal Portrush in the north, and the K Club in the south are two of the island’s most famous golfing destinations. Mainland UK has its own A-list in the shape of the venues for the Open Championship, such as Royal Birkdale, Muirfield, Royal St Georges, and the undisputed home of the game, St Andrews. Underpinning these are hundreds of clubs and resorts that can satisfy the demands of both golfers and their non-playing partners and families. If, for example, the attractions of London’s shopping and nightlife are a magnet, there are plenty of destinations around the M25 belt that can provide both golfing and urban pleasures. The Grove (www.thegrove.co.uk) in Hertfordshire and Coulsdon Manor, on the other side of town in Surrey are two such venues.If it is the wild and wonderful coastline that floats your boat, then one of the country’s links course is bound to blow away the cobwebs. Two of the best can be at Royal Liverpool (www.royal-liverpool-golf.com) and Moray Golf Club (www.moraygolf.co.uk), the latter situated on Scotland’s north-east coast at Lossiemouth. In Wales, views over Carmarthen Bay and some challenging links play can be found at the Machynys Peninsula Golf and Country Club (www.machynys.com). On the other hand, those in search of a more central location couldn’t find a more convenient and more luxurious destination than at The Belfry, near Sutton Coldfield in the West Midlands. Facilities include a spa, swimming pool, tennis courts and aerobics. The golf isn’t bad, either. It is, after all, the headquarters of the Professional Golfers’ Association of Great Britain and Ireland. Oh yes, and it also witnessed a famous victory for the European team in the 2002 Ryder Cup. Across the Irish Sea, the K Club (www.kclub.com) in County Kildare was the venue for the 2006 Ryder Cup, again won by Europe, and regularly forms one leg of multi-centre golf itineraries that have become a very popular means of taking in more than one course during a week-long package. Similar itineraries can be found for destinations on the UK mainland, too.You won’t have to look far to find plenty of promotional material for golf centres and breaks around Britain and Ireland. Not surprisingly, the internet has an abundance of sites offering packages to suit a range of pockets. Check out the facilities on offer, for example whether tuition sessions can be booked, while on itineraries be sure to ascertain how many days’ golf is included in the tour. What is not in dispute is the wealth of choice on the doorstep of Britain’s golfers.